Graduate in law (1969). Diploma in agriculture (1998). Lawyer (1974). Farmer (1996). Municipal councillor for Cefalù (Palermo) (1972-1975). 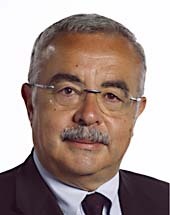 Chairman of the Palermo Provincial Council (1994-1995, 1998-2003 and since 2003). Member of the Sicilian Regional Assembly (1983-1986).